Since the adoption of the utility business model in the early 20th century, governments have relied on extending their national transmission grids to supply electricity to remote populations. Many countries in Latin America have followed this model. In the few cases where grids were not extended, electrification has been achieved by installing local diesel generation. Yet, both grid expansion and diesel generation have significant drawbacks: transmission and distribution lines in remote areas can be unreliable; logistics for diesel can be extremely complicated, leading to fuel shortages; and both methods can be very expensive. Both approaches can also cause serious environmental damage: diesel generation emits significant quantities of carbon dioxide and criteria air pollutant emissions, and grid expansion often requires constructing transmission and distribution lines through environmentally sensitive areas. Recent developments in microgrid technology, as well as the falling costs of renewable energy technologies and energy storage, have made it possible to shift away from the traditional centralized paradigm towards a more distributed and renewable energy landscape. Indeed, for areas in which demand is low or spatially scattered, renewable energy-powered microgrids often offer a more cost-effective power solution than either grid expansion or diesel generation. Moreover, when properly designed and maintained, technologies that use local renewable resources are less likely to suffer logistic or reliability problems. 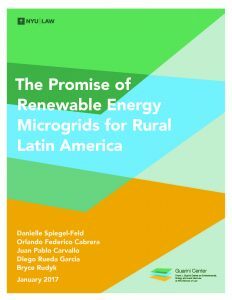 Given these benefits, renewable microgrids should be a favored mechanism for electrification in remote regions of Latin America. Solar microgrids should be particularly attractive given the abundant solar radiation that much of the region receives. And yet, deployment of solar microgrids throughout Latin America has been slow. To understand the cause of this stagnation, the Guarini Center on Environmental, Energy & Land Use Law at New York University School of Law, together with SolarCity, convened an international workshop in October 2016 to examine barriers and opportunities to microgrid deployment in remote regions of Latin America. The workshop brought together government and utility representatives from Latin American countries as well as development bank officials, private financiers, law firms, academics, renewable energy industry experts, and representatives of several inter-governmental and non-governmental organizations. Over the course of the two-day workshop, participants reviewed a series of case studies of potential renewable energy microgrid projects in remote regions of the participating countries. Each case study illustrated that solar powered microgrids offered a cost-effective alternative to diesel generation. Specifically, modelling indicated that installing a hybrid system in which photovoltaics provided a minimum of 66% of electricity consumed would lower the levelized cost of electricity in each community examined.